Even though it feels like January has lasted forever, it's been a pretty good month. I feel like I coped well. Even though I've spent a lot of the month on my own, I seem to have been well entertained and have plenty to be proud about. It's not always that I look back on a month and think: I want to document that. Because, as life goes, some months can just pass by in a flash and may seem somewhat unnoticeable. January 2018, hasn't been one of those and, with all the different things that happened, I thought it would be perfect to sit down, reflect, and write. This post is going to be sectioned up into different parts but, if you wish to read a little bit more in-depth about some of the things that happened in January you can check out THIS post (5 Walks in 5 Days: Week 15th-19th) and THIS post (Catch up #5: Week 8th-14th). Seeing as though I'm now the only person you'll meet that's obsessed with blueberries as I am, I thought I'd give everyone else a chance to catch up and try a new never-tasted berry lasrt month. Blackberry. You're most likely thinking: 'How on earth have you got to 18 years without trying one of those" and, truth is, it's just never been something that I've come across. As well as that, I've never been a huge berry gal - apples, pears and bananas were my sort of thing as a child. Now, as a new flourished berry-tastic woman, I'm going to be adding blackberries to my collection. My mum and I decided to try the very popular over-night oats. I plan to have a blog post going up this month with my overnight oats recipe but, for now, I just wanna give them some screen time and say that they're pretty cool - go give them a go! Right now, I kind of feel like I've just won an award and I'm trying to fit everyone into my speech in order to not offend anyone. So, there we go, overnight oats can't complain now. While you may be thinking: 'Wow, Alice! You're new foods last month were pretty healthy', it's simply because, while I've given up on the full-throttle diet thing, I have decided to make a few more healthy choices. I'm trying to keep processed food out of my diet if I can, and make sure that my portions are controlled. I'm not saying no to carbs and I'm not saying no to a bit of honey on my bowl of yogurt and fruit - I'm simply saying yes to a more varied and balanced diet. Included in this varied diet is Good Grain puffed wheat. I've seen them floating around Instagram over the past few months and, by gosh, they looked amazing. So, in my local Tesco, I paid the well-worth-it price of £1.35 for a box of JUST puffed wheat. It's nothing else. Basically sugar-puffs minus the sugar. I don't eat them on their own as cereal, I like adding them to yoghurt and fruit for a subtle crunch. They're fab! Despite experiencing a crazy amount of hassle with my network provider, last month I upgraded my phone to the iPhone 8 Plus. I am so super excited and grateful to have this phone because the performance is fantastic and the camera is stunning. I now have the bloggers-best-friend: Portrait Mode and, honestly, while it can be a little tricky to get to grips with at first, it can produce some stunning photos. As well as being incredibly lucky to get that phone, I was also lucky to receive more products from the lovely team at Botanics. This time I got the Facial Oil and the Hydrating Eye Cream, both from the Organic Range. 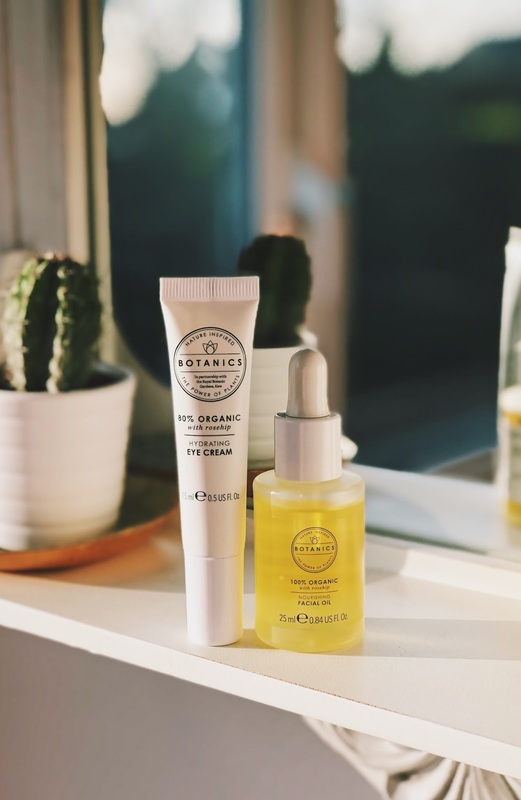 The product that I'm most excited about is the facial oil, I've already been using it and loving it because it actually works pretty well at replacing my rich moisturiser - I just hope that it doesn't break me out in spots. Let me know if you want a full review of these two new products on the blog soon. As someone who barely really watches films, there are at least 3 films that I've watched and enjoyed in January. The first one has to be the latest instalment of Pitch Perfect. Despite seeing some crappy critics reviews of it, for me, it didn't fail to make me laugh just as much as the first two films did. The characters in it are unforgettable and it really is a feel-good film. I've gotten into this habit of buying a TV magazine on a weekend and looking through every day, picking out films that I might like, and setting them for 'record'. With this, I've collected around 20 different films and, while I've only actually watched a handful so far, I like having them there for back up on a rainy day. I rewatched 22 Jump Street and one of my all-time favourite childhood films: Stuart Little. Drop me a comment if you too are kind of really still obsessed with that little mouse. One of the films that I recorded was The Love Punch. I'd never seen this film before but I do reckon that any film with Emma Thompson in it is destined to be a classic. It's your typical love story but with some funny pinches sprinkles through the plot - definitely perfect for a Sunday afternoon under a blanket. The 3rd and final new film that I really enjoyed last month goes to a film that unexpectedly grabbed me by the heart and threw me upside down. This was the 2015 film: Amy. A documentary film based on the life of Amy Winehouse. It was really gripping to hear about her behaviour and how so many bad decisions and mistreatment lead to such an unjustifiable death. I think, for me, this film is important and so sad because we get to see how, at the time, everyone saw her as a vulgar drug addict but underneath she was extremely vulnerable and she had been all along. If you want something gripping and eye-opening - this is the film for you. 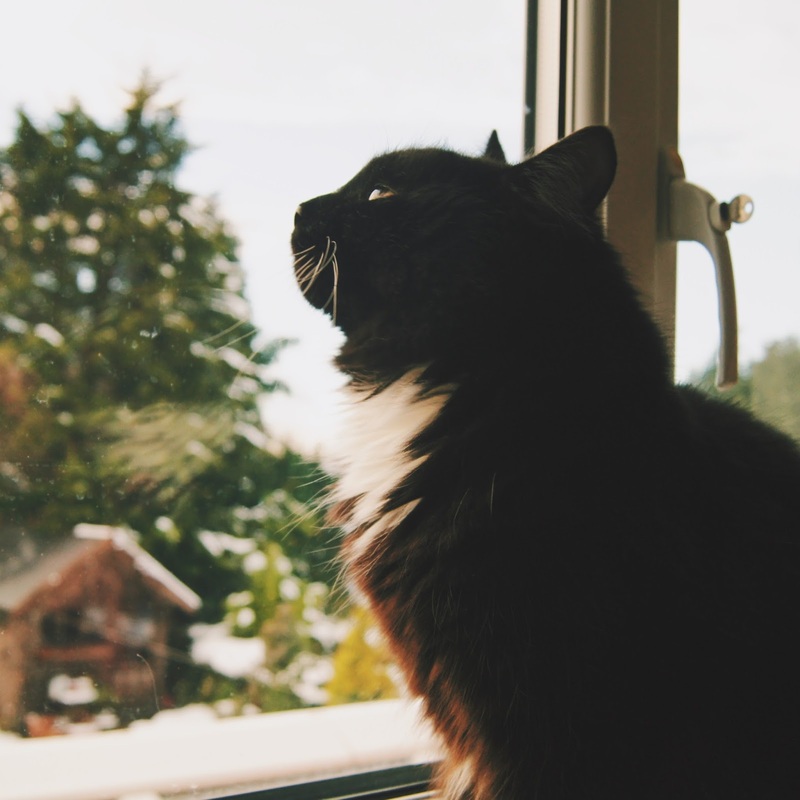 When I was sitting down to plan this blog post and reflecting on my month, I found there had been so many things happen in January that made me feel a bit like a boss; a mini punch-the-sky moment. There have been some incredible developments and changes happen in January - firstly, I feel like I'm getting there with my driving. With my test approaching very fast, I'm beginning to feel a bit more like I can do this. And, I know, the only way I'll pass is by believing in myself but, as always on this blog, I'm not going to sugar coat it - it's not easy to believe in yourself 24/7. That's why I feel so proud and delighted that this whole 'self-belief' is creeping in. (If you know me, you'll know that self-doubt is one of the main sections of my entire anxiety spectrum, so this is a great development). There have been some other little 'you can do this' moments in January. For example, I'm finally on Year 3 of my One Line A Day which is INSANE. As of June, I'm officially halfway through the entire book - it really feels mindblowing to me that I've got this far with it. Similarly, I have managed to continue a whole month doing my planner. It's always been a dream of mine to keep a continuous planner and have it look pretty and last month I did it. You know what they say: if you do it for 30 days, you can do it for many more. Last month, unfortunately, it took an illness to kick me up the backside and make me drink more water. Since then, I've been drinking water a lot more frequently. I may not yet be the recommended 2 Litres a day but, believe me, it's a massive improvement on what I used to drink. 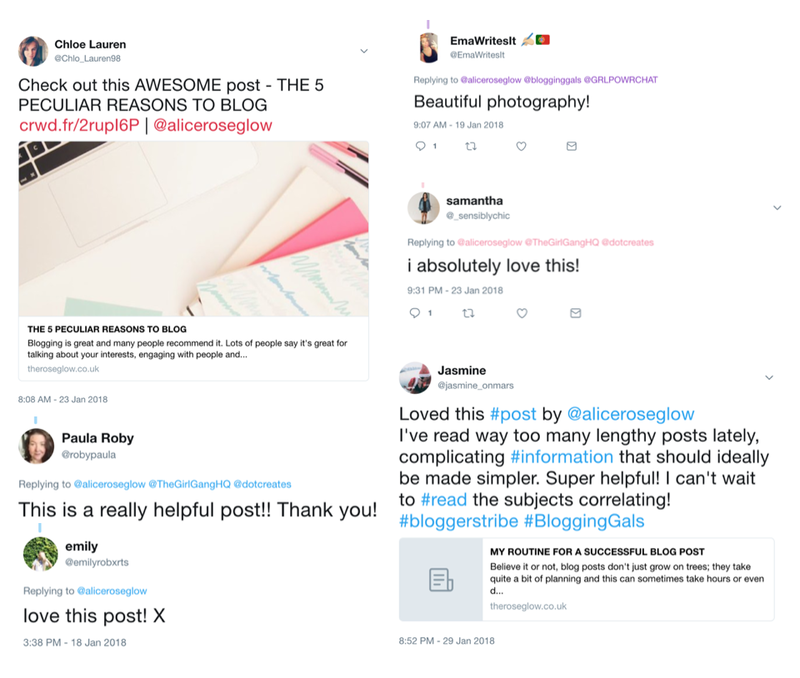 One thing that has made me feel so delighted in January is the amount of incredible and positive feedback that I am receiving about my blog. I've had numerous tweets and direct messages from people telling me that my blog post has helped them or that they enjoyed reading what I've written. As blogging honestly is my passion and writing/photography is something that I adore doing, these messages feel so rewarding. I am so grateful for all of the support that I've been getting recently - here are some tweets and replies to the promotional posts that I wanted to give a bit of recognition to. Please take from this that by telling someone you enjoyed their post instead of keeping it in your mind really does make a difference. We should all do it more often. So, for me, January has been one to remember. I may not have been flitting all over the country or doing anything majorly exciting, but I have achieved and there may be no better feeling than that. I've never tried overnight oats, but it's definitely something I do want to try! You should - I think it could be an acquired taste though, it's just a bit like cold, fruity porridge haha! Your 2018 has started on a great month!! You seem to have your intentions and focus in the right place. My January was a bit of a low one. I was a bit unsure with what I'll be doing this year. As a recent graduate I started getting real graduate blues. But now I've found a part time job in online marketing, which gives me more time to blog - I feel like February will be a better start to 2018 for me.